On a balmy summer day- with the sun playing hide-and-seek behind the clouds- I decided to hop on the Yellow MAX line from downtown Portland to visit the Mississippi neighborhood. 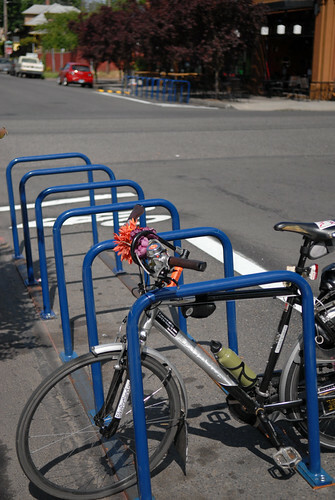 The concept of 20-minute neighborhoods prominently features in conversations about sustainable development in Portland, with a portion of the Portland Plan devoted to the concept. Currently, First Stop Portland is compiling a guidebook of Portland, with different chapters that focus on these various neighborhoods. I decided to take a fact-finding trip to one of the city’s up-and-coming neighborhoods, not only to collect information for the book but also to determine whether Mississippi fits the definition of the "20 minute neighborhood" concept. The best way to reach Mississippi by Max is to get off at the Overlook Park MAX Station, walk north on Interstate to Failing, turn right on Failing and take the Pedestrian Bridge over I-5. The pedestrian bridge gives you a view of the downtown Portland skyline, and as you cross the bridge facing east you can see the top of new development- Tupelo Alley on Mississippi- poking over the rooftops of houses that are decades old. Follow Failing St. to Mississippi, and on the northwest side of the intersection you will find Sunlan Lighting, 3901 N. Mississippi Ave., in which Kay Newell- aka “The Light Bulb Lady”- has practically every light bulb imaginable. As the only business of this type in the Northwest, Newell has a wide spectrum of followers, from local film crews to anyone looking for a little mood enhancer to make it through the long gray Northwest winters. Sunlan Lighting’s thematic window displays are always worth a peek. A couple more blocks will lead you to Prost!, 4237 N. Mississippi Ave., a German-style pub bar on the extreme Northern edge of the Mississippi neighborhood. Prost! might be the new kid on the block, but all ready it has received a receptive following in the neighborhood, who view Prost! as the ideal summertime hang out bar, with its large patio area that houses a handful of Portland’s renowned food carts, offering some delectable bites to accompany your Spaten lager or Spatzen dunkel. Prost! is housed in a building originally constructed in 1894, with the final restorative work completed by Eterne Architectural Design & Restoration in time for the bar’s opening in the autumn of 2009. Eterne specializes in restoring and recreating significant architectural structures, and it is of little surprise that Eterne is restoring the John Palmer House, 4314 N. Mississippi Ave., an elegant example of 19th century Eastlake Victorian architecture that sits kitty-corner from Prost! A former bed & breakfast, the John Palmer House can be rented out as a meeting space for non-profits, and also has rooms available for traveling cancer patients. Heading south from the Northern edge of the Mississippi neighborhood will bring you past the two main development projects on the Avenue, Mississippi Avenue Lofts and Tupelo Alley. Mississippi Avenue Lofts, 4138 N. Mississippi Ave., a 32-unit, mixed-use refill development that won the 2008 Green Building of America Award. The Mississippi Avenue Lofts was not constructed without controversy, however, for as a refill development within a historical district, the Lofts were opposed by the Boise Neighborhood Association, who argued that the building did not fit in with the context of its surroundings. The final compromise resulted with the Lofts being smaller in size- and more costlier units- than originally planned. A few blocks south will lead you to Tupelo Alley, 3850 N. Mississippi Ave., a superblock four-building development project with a stepped-back 5-story frontage on Mississippi and 3-story townhouses on Albina. The development maintained its eponymous alley, a breezeway that is popular with neighborhood bikers. Tupelo Alley’s main building offers a mixed use space of studio, and one and two-bedroom apartments, with ground floor retail, including Mississippi Treehouse, 3742 N. Mississippi Ave., a children’s clothing store that allows credence to the project’s “family friendly” mantra, and where I was able to score a great deal on heavily discounted brand-name baby clothes displayed on an outdoor sales rack. The ground floor of Mississippi Avenue Lofts has a Pastaworks store, a European-style market with multiple locations throughout Portland. Besides this market, however, the absence of other grocery stores became very obvious. It is hard to imagine one of Portland's top neighborhoods lacking a store to serve as a retail or employment anchor, but it appears that's the case for Mississippi Avenue. I asked a gentleman on the sidewalk, who said he had lived in the area for "51 years" of the location of the nearest grocery store, and he told me of the Safeway on Killingsworth or the New Seasons on Interstate, both of which were a "couple of miles away." Granted, there is Nu-Rite-Way Food Center, 3965 N. Mississippi Ave., which is likened more to a New York bodega than a Qwik-E-Mart, but for neighborhood residents needing to stock up for the week, it appears you have to leave the area. Does Mississippi still fit the "20 minute neighborhood" definition, even if residents need to ride transit 10 or 15 minutes to do grocery shopping or take care of other necessary errands? 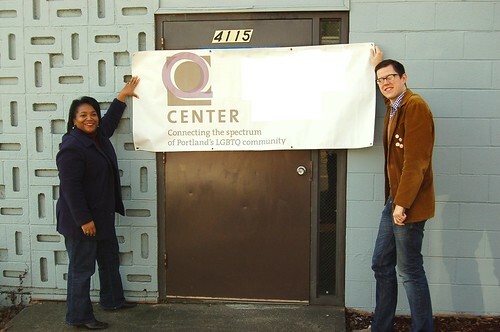 Further southward along Mississippi Avenue will bring you past the Q Center, 4115 N. Mississippi Ave., Portland’s LGBTQ Community Center, which houses Portland’s Gay and Lesbian Chamber of Commerce. Dance Aficionados might be interested in dropping by the offices of the NW Dance Project, 833 NW Shaver, which offers original performances, outreach efforts, and classes. Across the street you can enjoy fine courtyard dining at Equinox Restaurant, 830 NW Shaver, with a seasonal menu that currently offers summer entrees of wild boar gnocchi and pan-seared pork loin with Spanish chorizo hash. Mississippi Studios, 3939 N. Mississippi Ave., is one of the premiere venues for live music, with a focus on roots music and Americana acts. Across the street from the Studios, music lovers can grab a bite to eat from Miss Delta, 3950 N. Mississippi Ave., an offshoot of Southeast Portland’s Delta Cafe, which offers a southern-style menu of gumbo, jambalaya, and po’ boys. Check out Miss Delta’s happy hour menu and nightly specials. For desert, you may want to wander over to The Meadow, 3731 N. Mississippi Ave., where you can select from over 200 choices of gourmet chocolate (as well as pink Himalayan salt, if that’s what you’re in the mood for). Or, if you are in luck, the first retail scoop shop of local fave Ruby Jewel handmade ice cream sandwiches might be open, as they are making every effort to get their shop open “sometime in summer 2010.” Ruby Jewel sandwiches have cultivated a following with their constant presence at Portland’s farmers markets, and received financial support from Whole Foods Markets and product development support from the Oregon Food Innovation Center. I routinely purchase Ruby Jewel sandwiches from the freezer section at Whole Foods and Fred Meyer stores and am very excited about this retail shop opening! South Mississippi Ave. is anchored by Our United Villages, 3625 N. Mississippi Ave., a local non-profit organization, whose Community Outreach program provides resources and opportunities for neighbors to get to know each other, including workshops, panels, and storytelling sessions. Our United Villages also helped start the ReBuilding Center, which is the region’s largest volume of used building and remodeling materials. Three hundred daily visitors come to the ReBuilding Center to browse their inventory of salvaged and reused materials. On the opposite side of Mississippi you’ll find Amnesia Brewery, 832 N. Beech St., which always has a crowded outdoor seating area on any given sunny day. A few doors down you’ll find the old neighborhood stand-by Mississippi Pizza, 3552 N. Mississippi Ave., where you can grab a slice of pie and a beverage at the neighboring Atlantis Lounge, which holds an eclectic selection of live music, even the occasional kids show in the early evening or weekend. Finally, to finish off your day on Mississippi Ave., top it off with a waffle sandwich from the Son of Flavour Spot, a food cart at the corner of N. Mississippi Ave. and Northeast Fremont, which has been serving sausage-maple and black forest ham-gouda waffle sandwiches before food carts in Portland were all the rage. This is only scratching the surface of what’s available on Mississippi Avenue, as certainly there are many more restaurants, bars, and stores- including a renowned comic shop and record store- along this strip. In fact, the best suggestion is simply to hop on your bike, get on the bus, or lace up your shoes and head to Mississippi and explore for yourself. I might suggest doing so during the upcoming Mississippi Avenue Street fair, which will be held on Saturday, July 10th. According to the Mississippi Business Association, the ninth street fair promises to be the best one yet, with even bigger crowds than the 30,000 who attended last year’s fair. The Street Fair sounds like the perfect opportunity to try some German bier at Prost! while watching World Cup matches. If there are any overlooked insights into the Mississippi neighborhood that were not included here, please leave them in the comments section below!